20141222 - I make zero apologies for this page being slightly late. First things first - I will now be taking a two week break (partly for obvious reasons, partly to give my arm a rest). The next Kaspall update will be on 12th January. Now that's out of the way, about the page. There's a higher resolution version of the third panel here, if you fancy a closer look. 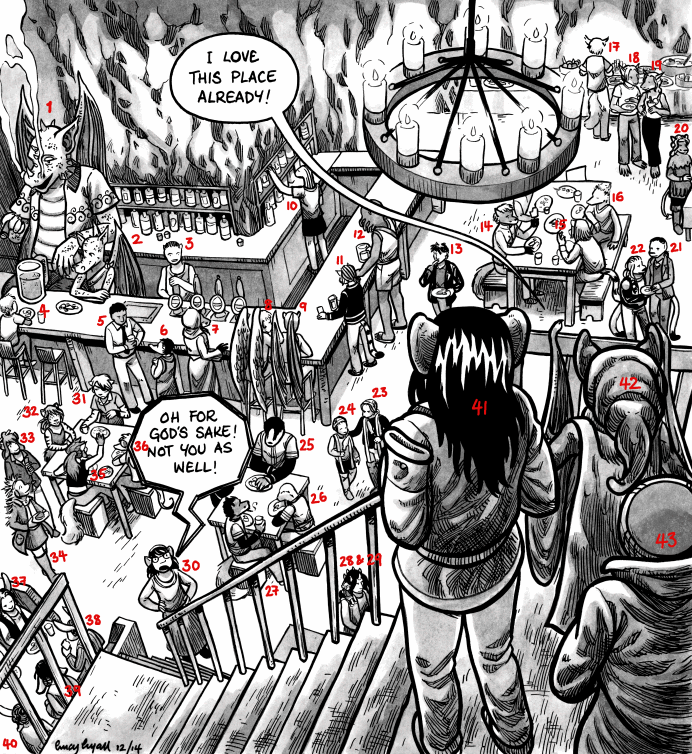 The page features twelve cameo characters from other Spiderforest comics (who be turning up in the background of some later pages ... along with everyone else). Most of them have been 'anthro-ed' with permission of the creators. That leaves thirty-one people - including the Captain, Harry and Mr. Rondin - who are more than just one arm at a table. All of them have appeared in the comic before, to some degree. * One was only mentioned in passing. * Two appeared in one panel only. * Three appeared in one page only. * The other twenty-five appeared in two pages or more. Lots of these characters don't have names, and I find it frankly horrifying that many of the main players in the story don't even appear on this page. If ever there was proof the story may have got away from me at some points, this is it. But it's a great way to fill a up a party. I've made a numbered version of the panel here (partly just to prove to myself that there really are forty-three characters here - it sounded a bit ridiculous when I wrote it down), so if anyone gets idiotically bored over the holiday period and fancies trying to identify all these buggers, then feel free. It may help to know that almost all of them are wearing basically the same outfits, because it makes them easier to spot, and also I really couldn't be bothered to invent new ones for them (we must assume that several people have arrived directly from work). Hope you all have a wonderful Christmas and New Year, and make mine a double champagne, please!